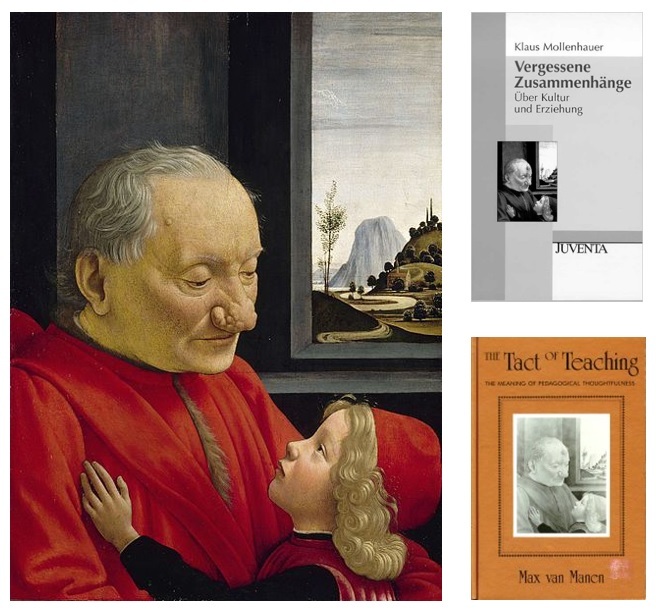 This image from Ghirlandaio’s An Old Man and his Grandson (recently restored, left), was used as the cover image by Klaus Mollenhauer for his 1983 book, Forgotten Connections: On Culture and Upbringing (translated 2014), and eight years later, on the cover of Max van Manen’s book, Tact of Teaching. In both cases, it illustrates what in both books is called the “pedagogical relation.” This refers to the relation of the young and old for the sake of the young. What does this picture say about relations between the old and the young? Have its connotations changed over the decades or the centuries? Does it bring to mind grandfatherly affection or something also unsettling? What it means for to have “a relation for the sake of the younger” can only be concretely answered in historical terms. What “for the sake of the younger,” what pedagogical responsibility means, this is subject to historical change and must… always be revisited and reconsidered. (1970). This is just what I try to do –to both affirm and reconsider the pedagogical relation in the 21st century– in the light of ongoing challenges to teachers and scandal among some of those charged with caring for the young. See my draft paper here. This entry was posted in Bernhard Waldenfels, Bildung, Klaus Mollenhauer, Pädagogik, Phenomenology. Bookmark the permalink.